Wagrain is a market town in the Pongau region of Salzburg. It has a total population of approximately 3,000. Wagrain is situated some 9 kilometres east of the county town St. Johann im Pongau. It is a well-known skiing area, but effectively a bi-seasonal destination that increasingly tries to draw attention for its hiking opportunities. In fact, Wagrain is quite popular during the summer, too: The local mountain of Öbristkopf with an altitude of approximately 1,400 metres is one of Salzburg′s most popular summits to conquer. The highest spot of Wagrain can be found on the southern Gabel mountain range and is 2,037 metres high. In terms of sightseeing, Wagrain offers several things that are worth noting. The parish church was built in Gothic style and extended in 1450 and again in 1711. The main altar dates back to more recent times (1976) and comes with a Gothic Madonna. There is a Baroque church dedicated to St. Francis (Franziskus) that was built in 1616. Otherwise, note the general appeal of an Alpine village; alas, don′t expect too much authenticity, since Wagrain is both too big and too touristy for offering that. The most important aspect of the local economy (apart from the general service sector) is winter tourism. Wagrain′s slopes and ski lifts are part of the Salzburger Sportwelt, which seeded the formation of the Ski Amade region. The latter is supposedly the biggest skiing area of Austria and among the biggest in Europe. 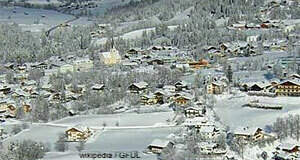 Wagrain is a member region of the Ski Amade. A few factoids about Wagrain: The Austrian writer Karlheinz Waggerl was born in Wagrain. He is still rather popular in much of the country and often commemorated with lectures and public readings in Wagrain. The priest Josef Mohr, writer of the lyrics for "Silent Night", worked in Wagrain after 1837. In the era of religious turmoil following social injustice and the reformation in the 16th century, Protestants were expelled from Salzburg in two waves. The first one in the early 17th, the second in 1730. Most of the Protestant families that were forced to leave Salzburg ended up in Prussia. Wagrain was the most severely affected community in Salzburg - a staggering 80 percent of the population chose to emigrate rather than return to the Catholic faith and accept the Prince Archbishop as the legitimate leader.